James Ross was a Canadian businessman, art collector and builder, who oversaw the construction of the Canadian Pacific Railway across Canada. In 1892, he commissioned Bruce Price, an American architect who has also designed McGill’s own Royal Victoria College and Quebec City’s Chateau Frontenac, to build a house on Peel St. on a huge lot along Montreal’s famous Golden Square Mile. 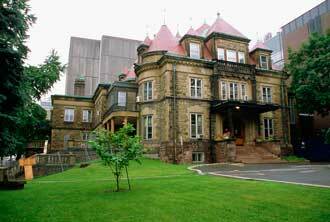 Today that house is McGill's own Chancellor Day Hall. The James Ross house, circa 1910 ... / photo courtesy of McCord Museum/William Notman and Son. James Ross was a Canadian businessman, art collector and builder, who oversaw the construction of the Canadian Pacific Railway across Canada. In 1892, he commissioned Bruce Price, an American architect who has also designed McGill’s own Royal Victoria College and Quebec City’s Chateau Frontenac, to build a house on Peel St. on a huge lot along Montreal’s famous Golden Square Mile. 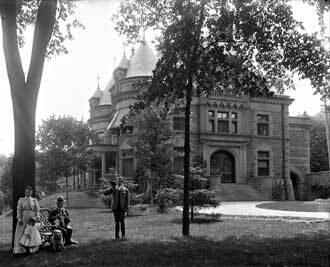 The massive house’s 41 rooms were set in a garden that extended almost to Sherbrooke Street. When McGregor St. (now Doctor Penfield) was extended, the property lost its garden. The house, though, kept getting bigger, with Ross commissioning a series of redesigns and expansions of his home from 1897 to 1912. During this period, Ross and his wife were instrumental in founding the Montreal Museum of Fine Arts, which officially opened its doors in 1912. Upon Ross’s death, his son, John Kenneth Leveson Ross, inherited the house. An avid horse breeder, philanthropist and bon vivant, J.K.L. was as well known for his lavish lifestyle (he kept 30 servants and a pair of Rolls Royces) and donating vast sums of money as for winning the first Triple Crown of Thoroughbred Racing in 1919 with his Hall of Fame colt, Sir Barton. Having inherited $16 million upon his father’s death in 1913, J.K.L. found himself down to his last $300 a mere 15 years later in 1928. In 1929, J.K.L. auctioned off the houses and moved to Nassau. J.W. McConnell bought the James Ross house in 1948 for the Faculty of Law and it was named Chancellor Day Hall after Charles Dewey Day, the University’s first Chancellor from 1864-1884. The McConnell Foundation’s gift in 1968 started off the construction of the New Chancellor Day Hall, a six-storey building that contained the Law Library on the top floor until the Nahum Gelber Law Library was built in 1998.